I am now offering new Mini Art Workshops for busy people. Shorter format workshops are meant to get your feet wet and give you a taste of the subject matter. I am excited to offer a new encaustic workshop next month. I often have people ask me how I create my encaustic image transfers. Well, in this workshop I will reveal the secret! It's been a while since I have offered an encaustic workshop. The last few months I have been concentrating on Open Studios and teaching an 8 week art course to teens at the Palo Alto Art Center. I thought this summer would be a great time to schedule a new Intro to Encaustic Workshop. If you have ever been curious about encaustic painting or even wondered how you might be able to incorporate it into your current art making practices this workshop is for you. To learn more about and or register for this course head on over to my WORKSHOPS page. I have also added a few other options for open studio time and private lessons. Maybe you have already taken an encaustic class but don't have the space or tools to play around with it more. Do you have a project or problem you are working on and can use a little extra help or time? I have created an open studio free time option where you can come to my studio and work and I provide all of the materials and tools. You can learn about that on my Workshops page as well. Is there a specific technique you would like to learn with encaustic, book art or any other of the mediums I teach? Are you busy and can't fit in a 4 hour workshop? Then a private lesson might just be perfect for you. Private lessons offer more flexibility in scheduling and allow us to really focus on the topics that are important for you. This past Thursday was the first class in the "Compose Yourself" teen arts workshop series at Palo Alto Art Center. In this first class I taught students how to make and use a pinhole camera and how to make photograms in a darkroom. I set up a small makeshift darkroom in the basement of the art center. It was so great going back to my photography roots, the smell of the chemicals brought back all the fond memories of working in the darkroom for hours and making magic happen. The best part was seeing the reactions of the students. They had never experienced that kind of photography or a darkroom before. They were completely engaged and excited. They got to experiment and practice with different light sources (we didn't have an enlarger) we used our cell phones, exit signs and other light sources to expose the photo paper for the photograms. They loved seeing the images emerge from the developer and learned all about the darkroom set up. The great thing about this program is the students also get to learn about problem solving, best practices of art-making, personal branding and a variety of creative techniques. There is still space left for students to sign up for the whole module or individual classes.You can learn more about them here. The next class is photo re-imaged where we alter, paint, cut and re-imagine our photos to give them new or expanded meaning. I had a great time last week teaching a book arts workshop to teens at the Sunnyvale Public library. I really wasn’t sure what to expect. I have taught small workshops with adults and young children but never young teens and never more than 10 students. It turned out to be a really cool experience. There were about 18 students mostly young women but a few creative young men as well. I started by telling them about the anatomy of a book, talked about how to check if a book is first edition or valuable and then showed them different things they can make with old books. Then we made a bunch of paper feathers to get comfortable with cutting, gluing and shaping. Then we jumped right in and started making the hanging book mobiles. This is where they had a chance to get really creative picking out the book they wanted to use, how they wanted the pages to hang and the finished piece to look. Some got through the project really quickly while others took their time and were more meticulous. One fun thing that I didn’t anticipate was that several of them decided to use the feathers they made to decorate the outside of their mobile. The staff and facilities at the Sunnyvale library were fantastic too. I appreciated all of their help. I am really glad I had the opportunity to teach the workshop and hope I can do more in the future. The past few months I have been teaching a variety of art workshops and have really been enjoying myself. I have always wanted to teach but for a variety of reasons never really pursued it. I had done private art lessons, demonstrations, and mentoring but never taught a real class or workshop with multiple students. Well the fates aligned and I met Jeanne of Twin Soul Art Studio, she was looking for new art teachers for her studio and I was ready to take the leap into teaching. 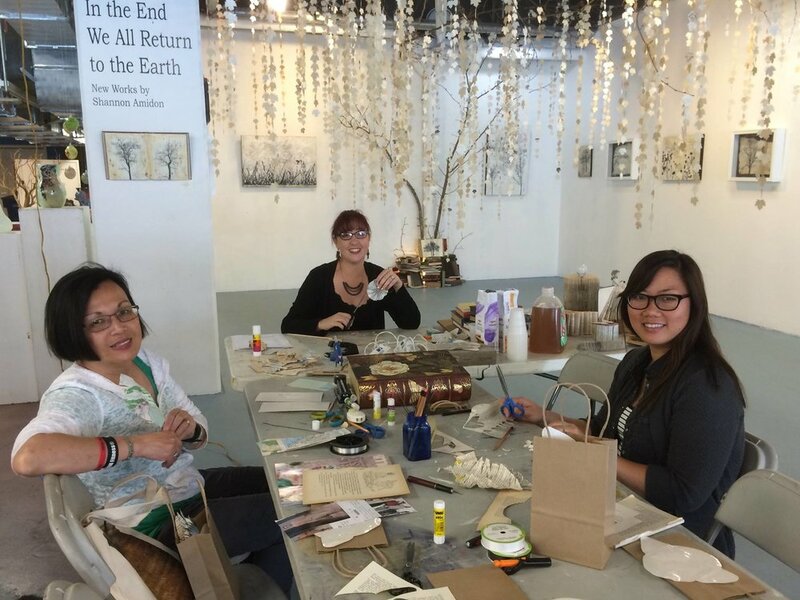 I love teaching at her studio, its a beautiful creative space in Los Gatos and she always makes everyone feel welcome and creative. Now a whole world of teaching has opened up for me and I am often thinking of new workshops or classes that I can offer. I have also started teaching at a few different locations.This allows me to connect with a variety of students. My next workshop is Photographic Lumen Printing. This is such a cool technique using old black and white photo paper and plants. Part of the fun is that you never know what you are going to get, the results are unpredictable and influenced by the type of plants, weather, brand of photo paper and more. Each student will get to make and take home 5-8 finished pieces. $35.00 per person – Materials Included.